The homes – which will be made available at affordable rent – form part of the council’s wider plans to transform Townhill Park and revitalise the local community. Each of the six family homes, located in Roundhill Close, has three bedrooms, a lounge/dining room, separate kitchen, bathroom, back garden with shed, and two parking spaces. 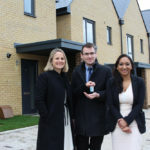 Pictured above from left to right are: Leanne Smith, Head of New Business, Drew Smith Group, Councillor Christopher Hammond, Leader of Southampton City Council, and Councillor Satvir Kaur, Cabinet Member for Homes and Culture, Southampton City Council.